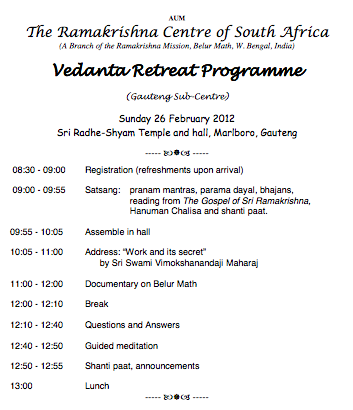 Very grateful for receiving today’s Vedanta Retreat programme at Sri Radhe-Shyam Temple, Gauteng. I feel that some of the events could be moved to the afternoon or to be cancelled and increase the duration of your address. Devotees want to maximise their time with “sadhu sangha”! Please forgive me for my initial thoughts. This was an excellent retreat! I especially enjoyed your address. You have such wonderful ways of explaining. Due to Divine Grace, I could offer my homage at the lotus feet of Sri Sri Thakur on the sacred tithi of Shukla-Falgun-Dwitiya (23rd February 2012) at holy pilgrimage of Belur Math. a) In the peak of spring, the entire campus of holy Belur Math was covered with amazing variety of beautiful flowers everywhere, of which the red-coloured ‘Palash’ flowers were the most distinctive. b) The road leading from the main gate to the Holy Shrine had beautiful arches, specially erected to mark the holy occasion. c) Pictorial depiction of Holy messages from the Sacred text of ‘Sri Sri Ramakrishna Kathamrito‘ were also lined up one side of the road leading from the main gate to the holy Shrine. 2. It was absolutely dazzling to see the exquisite floral decorations at each of the temples in the campus of holy Belur Math. I felt spiritually enthused and energized when I was able to offer my homage to Sri Sri Thakur, Sri Sri Maa, Sri Sri Swamiji and Sri Sri Rakhal Maharaj at their respective Temples. 3. It was so spiritually uplifting to witness Bhog-Arati, Homa and Sandhya Arati in the sanctum sanctorum of the holy shrine. 4. And it was equally elevating to be a part of the rich cultural treasure, comprising of devotional songs, readings from the holy texts as well as lectures by eminent monks, being simultaneously enacted on the dais of the beautiful Pandal erected on the spacious lawns situated between the holy shrine on one side and the holy River Ganga on the other. The lecture session was chaired by His Holiness President Maharaj himself. 5. The sight of holy River Ganga was a purifying spectacle for all the devotees. 7. And last but not the least, it was also gratifying to partake holy Charanamrita and holy Prasad of Sri Sri Thakur. All in all, a divine experience ! I want to thank you for the inspiring spiritual Retreat held in Gauteng. It was truly wonderful being in your presence. Welcome to this blog! Hope you will be delighted to go through the archives also. Glad that you felt blessed by participating in the Vedanta Retreat. We have, perhaps you might have known by this time, that at Johannesburg, two Retreats. The second Retreat is scheduled on September 7, 8 and 9. This is a 3-day Retreat which will be conducted by my brother monk Swami Saradaprabhanandaji. Please contact the concerned official of our Joburg Sub-centre and register yourself early. You may recommend this Retreat to many of your interested relatives and friends too.